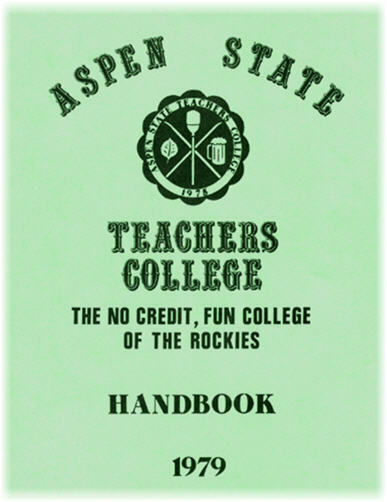 Aspen State Teacher's College (ASTC) was formed in 1974 by Dr. Slats Cabbage AKA Marc Demmon and Fulton Begley, III AKA Al Pendorf in Aspen Colorado. "Big" Jim Furniss joined in as Harold Center, Dean of Destruction during the Aspen Pedestrian Mall project. Together the three men and a cast of thousands purpetuated the "No-Credit Fun College of the Rockies" and built a legacy that stands strong today. A wildly successful 30th Reunion was held in September, 2005 in Aspen, CO. Past and current faculty & student body enjoyed reminiscing about the numerous events that have occurred over the Instutution's illustrious 3 decades. Keep your eyes out for the book that will tell all... Could there even be a feature motion picture?? ?